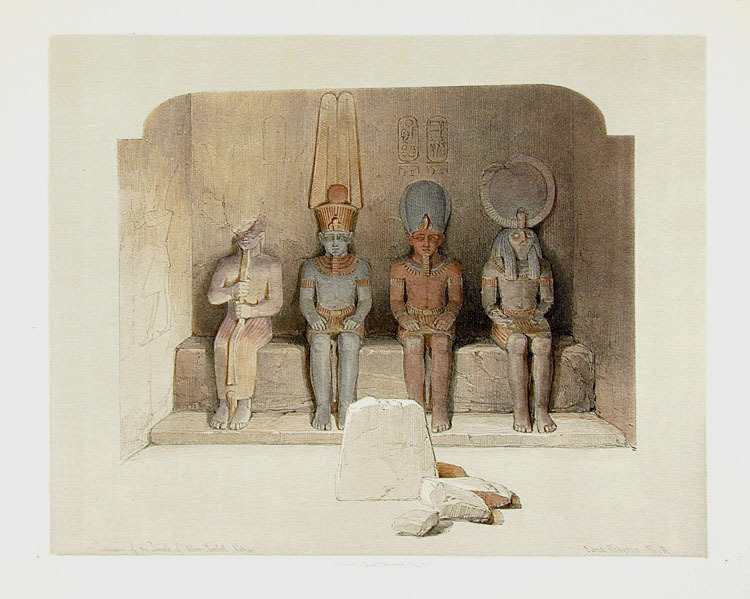 Comments: This quartet of dieties, including Ramses II as a god, is situated at the deepest part of the temple sanctuary within the rock, some 125 feet from the entrance, yet is placed such that it is illuminated by the rising sun at the solstices. Aboo Simbel was the largest and most famous of the temples relocated above Lake Nasser upon the building of the Aswan High Dam, and was reconstructed so as to preserve this phenomenon. Price: $400 uncolored, $475 colored. Title: The Sanctuary of the Great Temple of Aboo Simbel, Nubia. Condition: Excellent. Accompanying text below the image and on verso. Paper : 16 7/16 x 23 15/16"
Image: 9 7/8" x 12 1/2"